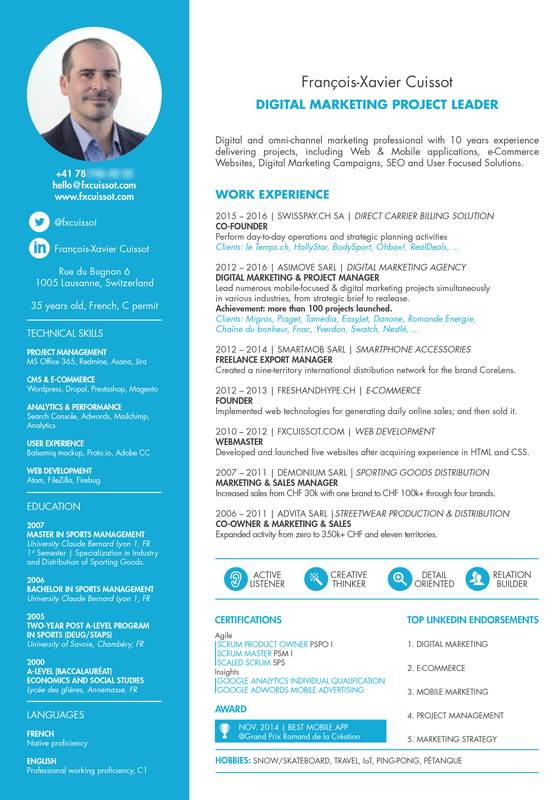 Digital and omni-channel marketing professional with 10 years experience delivering projects, including Web & Mobile applications, e-Commerce Websites, Digital Marketing Campaigns, SEO and User Focused Solutions. Leading Digital Projects as the interface between Marketing and IT departements with the aim of maximizing business value. Lead numerous mobile-focused & digital marketing projects simultaneously in various industries, from strategic brief to realease. Created a nine-territory international distribution network for the brand CoreLens. Implemented web technologies for generating daily online sales; and then sold it. Developed and launched ve websites after acquiring experience in HTML and CSS. Increased sales from CHF 30k with one brand to CHF 100k+ through four brands. Expanded activity from zero to 350k+ CHF and eleven territories. MASTER IN SPORTS MANAGEMENT University Claude Bernard Lyon 1, FR Specialization in Industry and Distribution of Sporting Goods.